The Raid on Pickawillany is a famous event in Ohio history, and one of the events that led to the French and Indian War. On June 21, 1752, the Miami Indian village of Pickawillany was attacked by 240 French allied Ottawa and Ojibwa Indians led by the métis coureur de bois Charles Michel de Langlade. The purpose was to drive British traders out of the Ohio Country and to punish Miami Chief Old Briton for rejecting the French alliance and dealing with the British. The raid resulted in the deaths of at least one English trader and Old Briton, who was boiled and eaten by the Indians. The French and Indians burned the English stockade and storehouse and sent the remaining traders fleeing back East. When Céloron's expedition arrived at Logstown, the Native Americans in the area informed Céloron that they owned the Ohio Country and that they would trade with the British regardless of what the French told them to do. 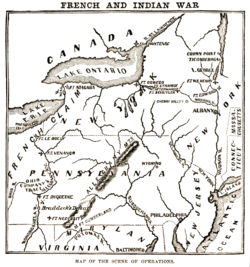 Céloron continued south until his expedition reached the confluence of the Ohio River and the Miami River, which lay just south of the village of Pickawillany, the home of the Miami chief known as "Old Briton". Céloron informed "Old Briton" that there would be "dire consequences" if the elderly chief continued to trade with the British. "Old Briton" ignored the warning. Céloron and his expedition went no further, and eventually returned to Montreal in November 1749.